Am I the only one who sees Martez Wilson as an OLB right now? We have Lofton, Vilma and Hawthorne in the middle and all of them will stay in NOLA. I agree we should bring in Butler or any other vet OLB, but I more and more can't see us drafting a OLB (at least in the first 4 rounds). We'll go OT, DL and Safety with our first 3 picks. I see him as both, but I think he'll be put at OLB. I don't. Other than Spags being an idiot and moving Wilson to DE last season (in which he did nothing)...there is not a single reason that I believe that Wilson will thrive at OLB. He does not run the arch well...he's too tight. He doesn't play man coverage especially well. Everything that he has done well at...has been up the middle. He played MLB in college and was excellent. He was very good blitzing up the gut from ILB in the 3-4 under GW. And 2 of the 3 sacks he had last year were up the guy. The other sack was the sack to close the game against a hobbled SD LT. I could have made that sack. He's a ILB...and if the Saints don't have him there...they are essentially wasting the kids career. The doctor and the paratrooper continuously see eye-to-eye on this point. Wilson is an ILB. He is the yin to Lofton's yang at ILB...which is what we need. I think Junior is a physical freak at OLB... and I think Tez is the same in the interior. We need a stud at ILB to help Lofton become this tackling wall. 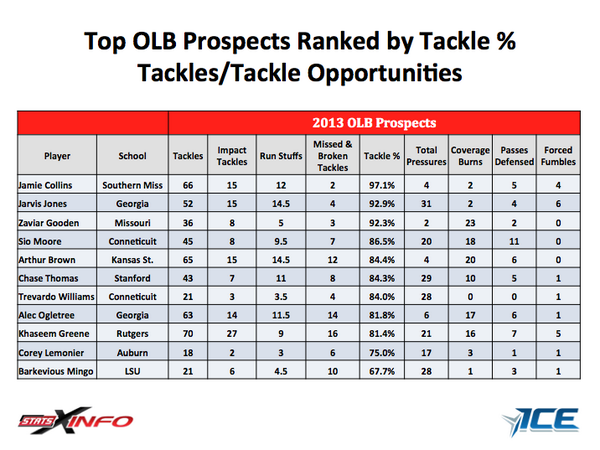 Tez couldn't play OLB nearly as well as he played ILB. I hope Ryan sees that. People bash Gregg Williams...first for the last two playoffs and then for the bounty. But he knew his personnel and put them in a position to thrive. He realized that Wilson was an incredible playmaker at ILB and I am convinced that is one of the primary reasons why the Saints moved to the 3-4 late in 2011. I really hope that Ryan does his homework. There really is no end to the potential of Martez Wilson at WILB. He could become the best player on the defense. Speak of the Devil and he shall appear... Agreed. Like I said, we need a physical freak in the interior... no need to shop for him, cuz we have him in Tez. He goes along perfectly with Junior on the outside and compliments Lofton big time. With Ryan we potentially have 4-6 formation to run out of too...If we upgrade at FS, we have the PERFECT SS in Roman Harper to fulfill that role. I think we have had some serious coaching problems with spags... If Ryan is half as good as people say he is, he can make this defense exponentially better. I see us grabbing one more big player on Defense; either a safety or an OLB. If we grab that, there's literally no other option in the draft than either what we didnt make up in FA (safety or OLB) or a NT. That's literally it. I couldn't agree with you more. Harper is going to be starting at SS whether people like it or not. I haven't liked it the past two season (though Jenkins is without a doubt worse)...but there is no denying that Harper was one of, if not the best player on our defense under GW. He's a monster in the box. But the Saints need that FS able to play cover one (like Sharper did). 1) LT- there isn't a reliable one on the roster. With the lack of immediate starter talent in the draft outside Fisher, Joekel, and Johnson (who likely will all be gone)...the Saints need to find the replacement in free agency. Brees does make LT look better than they are...but still, Bushrod and Brown were good LTs he turned into pro bowlers. You can't assume, just anyone can play the position. 2) FS- Jenkins is NOT a FS. He may be a decent nickel...but his career as a FS should be over. Not lots of help through the draft. Vaccaro may back a decent FS but is certainly not worth #15, certainly considering that the Saints will be running lots of cover 1 with Harper closer to the line of scrimmage. This is also a FA need unless the Saints feel confident in IAQ. 3) SOLB- I believe that Galette will start at WOLB, but there is not currently a WOLB on the roster. Hawthorne is not that guy. Ryan likes his SOLBs to not only be able to cover TEs and set the edge, but to also rush the passer. Lots of guys may be available in the first round who will fill this role nicely (Jarvis Jones, Dion Jordan, and Jamie Collins come to mind). Otherwise, I think that the Saints will likely ride with what they have and add to the depth. With Will Smith back in the fold...I think that D-line is pretty stable. ILB is set with Lofton, Hawthorne, Vilma, and Wilson (who will probably play in sub-packages at OLB and ILB). Harper will be back for another year...and Raphael Bush is a heck of a backup SS. He really has potential to be the future at the position. CB is also looking solid with Greer, PRob, White, Lewis, and Jenkins. If the Saints were to bring in a FA FS, who would you propose? I don't see a whole lot of FS out there. Plenty of SS options, but the FS market is pretty thin. It is thin...and growing thinner each day. Obviously Reed and Bryd are top tier. Ronde Barber, Louis Delmas, and Kerry Rhodes would be the next tier down. I think that Kerry Rhodes would be the best signing. Solid 1-2 yr stop gap who can play some cover-1. In round 3-4 I am looking at Baccari Rambo & D.J. Swearinger as guys who can eventually become good FS. I don't see a big difference between those two and Vaccaro. Found this in another thread in the Draft forum. Pretty interesting chart and really lends some steam to Collins. I was one of the ones that said I would be disappointed with Collins at 15, but after actually taking some time to watch some film on him, he's starting to grow on me. Wow 67% for mingo is awful! Yah. I really like the fact that once they get their hands on you, you're going down.